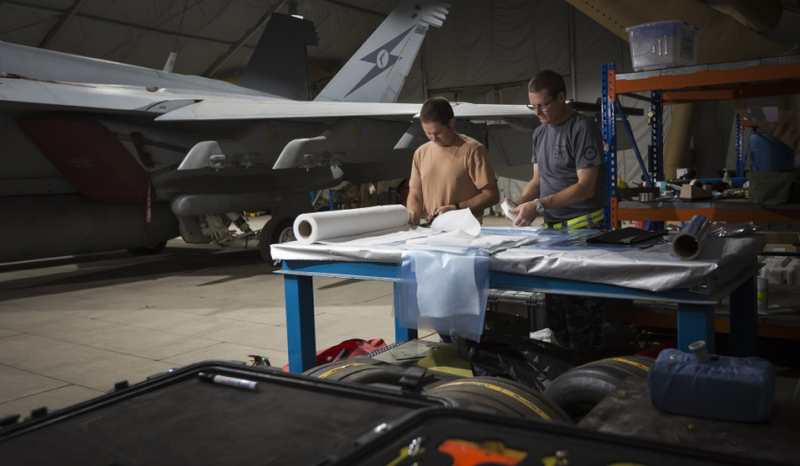 Royal Australian Air Force (RAAF) aircraft structural technicians prepare vacuum bags for carbon fibre composite repairs for an RAAF F/A-18F Super Hornet aircraft at the main air operating base in the Middle East Region. Canberra-based homeland security specialist Xtek has announced it has raised capital to commercialise its composites technology. Xtek has raised an oversubscribed placement of $3 million from what it has called "sophisticated and institutional" investors to build commercial scale production capacity and to pursue larger contracts. The placement was conducted at an issue of $0.46 per share, a 16.4 per cent discount on XTek's last trading price of $0.55 per share. Perth-based financial securities firm Patersons Securities acted as sole lead manager on the placement. Eligible retail shareholders will be able to participate in a share purchase plan worth up to $500,000. Xtek chief executive Philippe Odouard said the support shown from this venture illustrates the market's confidence in Xtek's place in the industry. "We are pleased by the considerable support shown during this equity raising. It reflects a strong endorsement from the investment community and Xtek's shareholders, and places the company in a very strong position to accelerate the growth of the business and to benefit from the global trend of increased government spending on security equipment and technology in the face of growing global uncertainty," said Odouard. Odouard told Defence Connect the use of composites technology has various uses in defence and aerospace, which Xtek hopes to capitalise on. "Composite is used in a large number of applications in Defence and Aerospace. Our technology could be used very effectively for complex shaped structural parts for aircraft, land vehicles and ships," he said. "It can also be used very effectively for ballistic purposes such as small arms protective insert plates and helmets. The latter applications are the most mature and commercialisation by Xtek is already under way for these. We are gradually developing the former, which have a much wider quantities and potential but will take longer to develop and commercialise." Xtek has secured a string of supply and trial contracts with the Australian military and police, and the US military. Most notably, Xtek was recently chosen as supplier for the Australian military's $101 million investment in small unmanned aerial systems. Xtek's share of the contract is estimated to be around $40 million with maintenance and consulting fees. The company is also supplying an Australian police force with two bomb disposal robots. The defence contractor also secured its second trial contract with the US military to test its XTclave composites technology as an insert for body armour.